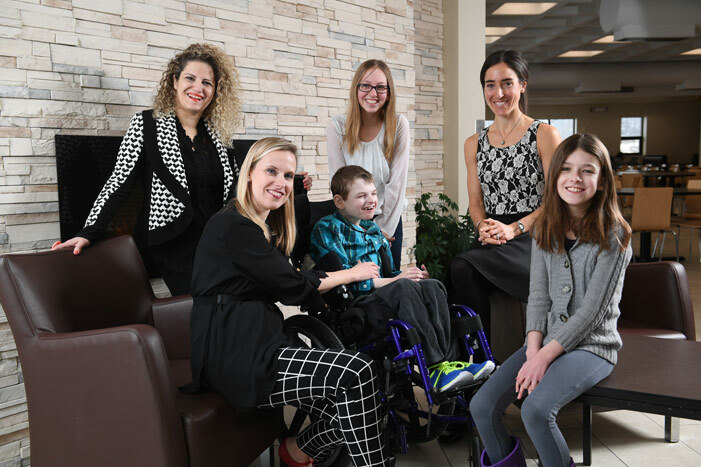 A new centre set up to aid children with complex health conditions and their families has been launched by researchers at the University of New Brunswick and Mount Allison University. NaviCare/SoinsNavi is a virtual centre that will help young patients and their families navigate the maze of health care needs and professionals they often confront. Funded by a generous $750,000 donation by the New Brunswick Children’s Foundation, the 24-hour, seven-day-a-week service was developed by Dr. Shelley Doucet of the University of New Brunswick Saint John and Dr. Rima Azar of Mount Allison University. “The navigation centre has the potential to significantly improve health care for children with complex health conditions in New Brunswick by ensuring that they have access to integrated collaborative care that is timely, convenient and meets their unique needs,” says Dr. Doucet, the Jarislowsky Chair in Interprofessional Patient-Centred Care at UNB Saint John. “Our vision is that every child or youth with a complex health condition receives the care they require in a timely manner, in the appropriate setting for his or her family,” says Dr. Azar, an associate professor of Health Psychology at Mount Allison University. Peter Daniels, a director with the New Brunswick Children’s Foundation, said the $750,000 donation to launch the centre is the largest single gift the organization has given. “Providing help to children in our province is a fundamental goal of our foundation and we are delighted to be able to assist in such an important project,” said Mr. Daniels. The foundation assists vulnerable children and children with disabilities throughout the province. A unique aspect of NaviCare is the involvement of a patient navigator, which is a relatively new and innovative role in Canada. The navigator advocates for children and their families whilst being a resource for the care team. Sherry Vautour, a registered nurse from Moncton, was recently hired for the role. As the service was being developed, a family advisory committee was formed to gain additional insight and input from parents of children who could benefit from the development of the centre. “As a parent who has a child with complex health needs, I understand the challenges that families can face,” says Jennifer Belyea of Hampton, a member of the family advisory committee and the newly hired program co-ordinator for NaviCare. Dr. Eddy Campbell, UNB’s president and vice-chancellor, salutes the service’s collaborative nature and the impact it will have throughout the province. “It is another strong example of how research at UNB and other universities in the province is being applied in the community,” Dr. Campbell says. “The research and development of NaviCare will strengthen our province and lead to improved health for many who require this important service." “I would like to congratulate Drs. Doucet and Azar, along with their collaborators, for their hard work and dedication in bringing NaviCare to its official launch,” says Dr. Jeff Ollerhead, provost and vice-president, academic and research at Mount Allison University. “This launch is testament to their commitment to build and bring this important initiative into operation. It will undoubtedly offer a new and valuable tool to families striving to help their children with complex health conditions." NaviCare is hosted by Sykes Assistance Services, the firm also responsible for the existing New Brunswick Tele-Care program. NaviCare can be accessed by calling 1-888-641-1977. More information on this virtual service is available at navicare-soinsnavi.ca. There will be no charge for using the service, which is offered in English and French.